This property gives the feel of a private resort with abundant tropical foliage and fruit trees. An inground screened pool beckons you to spend lazy days floating in the cool water. A small lake in the rear of the property provides a beautiful backdrop for your Naples vacation! A generous great room welcomes you as you enter your vacation home. Immediately, you will notice an open and welcoming vibe with soft neutral colors and small, fun pops of decorative color. The living area features two large, plush sofas, original artwork and a flat screen TV. An additional reading/contemplation area on the other side of the great room space with a comfy convertible sofa. The views from the property are serene and tranquil with water everywhere! Looking out over a triple size sliding glass door, you will enjoy both your pool and pool deck, as well as the lovely lake behind. In addition, fruit trees with their luscious ripe fruit adorn the backyard just waiting for you to enjoy their bounty! A spacious and efficient kitchen will tempt the chef in your group to roll up his or her sleeves and get to work! Lots of work space, plenty of wood cabinets and stainless steel appliances all come together to create an environment deserving of your culinary masterpiece. If you’re feeling elegant, take your dinner in the formal dining space, overlooking your picturesque water view. If it’s a more casual meal, enjoy it in the dine-in area of your lovely kitchen. The intimate King Master suite is a charming, intimate space with uniquely beautiful furnishings and decor. Enjoy your own private en suite bath. Two additional Queen bedrooms and one bedroom with two Twins provide plenty of flexible sleeping space for all of your guests. Naples is a place that thrives on activity. Within minutes, you can be at a sugar sand Gulf beach. If you prefer, there are several upscale shopping and dining venues that may capture your interest for a day or two. Then you can visit the galleries and antique shops. There is never a shortage of things to do and places to go! 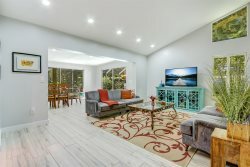 Whether you choose to stay home and relax with your tranquil and serene views or paint the town, your Naples vacation home will be a family memory to treasure. Essentials, TV, Cable TV, Air conditioning, Kitchen, Wireless Internet, Washer, Dryer, Pool, Free Parking on premises, Shampoo, Hangers, Hair Dryer, Iron and laptop friendly workspace.